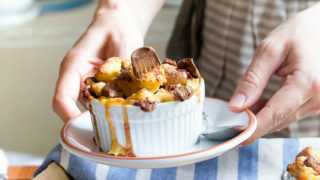 Chocolate bread pudding with caramel Rolos. 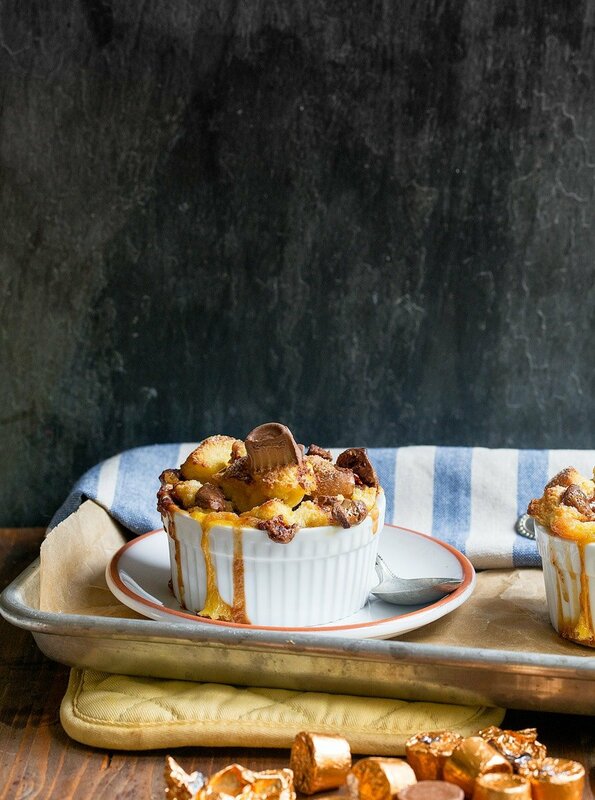 The best 5-ingredient chocolate caramel bread pudding for two! We are gathered here today to talk about how it only takes 5 ingredients to have a fantastic dessert. And no one knows this better than my friend Phi who just wrote a cookbook called Fast and Easy Five-Ingredient Recipes: A cookbook for Busy People. Her book is absolutely incredible, and I want to make just about everything in it. I skipped to the dessert section first (duh), and when I saw this gem of a recipe, I knew I had to make it. She calls it Chocolate Bread Pudding, or Rolo Bread Pudding. I call it delicious. The thing is, Phi is a woman after my own heart. 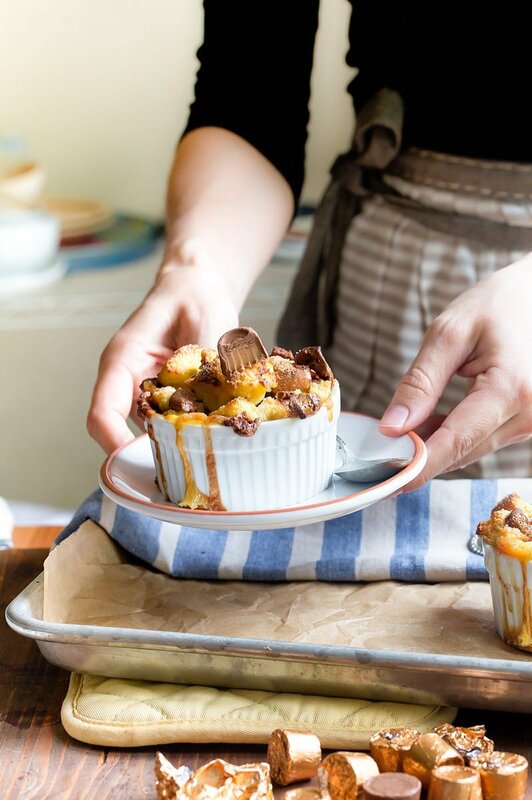 Her recipe makes just 1 ramekin, and it’s up to you to scale it up however you like. I am obsessed with this (to put it lightly). Can you double this chocolate bread pudding recipe? Yes, of course, I doubled the chocolate bread pudding recipe to serve two (it’s kinda my thing…did you know that? ), but I could also see myself making it for myself when no one is around. Or, for 8 people the next time I have a dinner party. There is no one who doesn’t like chocolate caramel bread pudding. No one! Our five ingredients today are: Rolos (buy the big bag because it’s basically an unwrap one:eat six ratio situation), white bread, eggs, milk, and sugar. Easy, right? Phi’s cookbook officially comes out July 19th, but you can pre-order it on Amazon today. As an author, I can tell you that pre-orders are super important and very helpful for authors. Pre-orders help spread the word that a book is in high demand, and help it garner media attention. So, if you see a book that you like but it isn’t out yet, go ahead and pre-order it! You’ll get a nice surprise in the mail when it does come out, and you’ll also be helping the author out. Ok? Spray two ramekins with cooking spray, and place on a foil-lined baking sheet. In a bowl, whisk together the egg, milk, and sugar, and then 8 of the chopped Rolos. Divide the mixture between the two ramekins. Add the remaining chopped candy on top, plus a sprinkle of sugar. Bake the ramekins on the baking sheet for 30 minutes. When you remove it from the oven, it will be puffy and deflate as it cools. Allow to cool for 10 minutes before serving. Christina, I am speechless! This is SO INCREDIBLE! Thank you SO SO SOOOOO much for your super kind words and for making one the recipes from my cookbook. The photos in this post are stunning (per usual of course), and I am just dying to go home and make these again (for like, the millionth time, they’re so easy and delicious, aren’t they?!) Again, sending so many thank yous your way, you totally made my day! Haven’t had a rolo since I was a teenager and you have me asking myself why. And I’ve always wanted to make bread pudding, just haven’t thus far. Bucket list helllllloooooo. Just for two? I guess Chris is going to miss out on it because I don’t think I could stop at one. Oh dear. This has my name written ALLLLL over it. Another recipe to try and another cookbook to add to the collection. Thanks for sharing! I love puddings and your chocolate caramel bread is simply great. A wonderful additional to my collection. Thanks a lot. good lord!!! it’s Monday morning and I am shamelessly craving this, it looks SO good!! This bread pudding is AHHHMAZING!! !